It is in 3 sections – the first two of which I have skipped over in order to get to the ‘how’ of the matter. The following is not a review of the book – I have been prompted to put some thoughts together after reading it. Case Study 1 Currant p184 on DevelopMe! Develop Me! 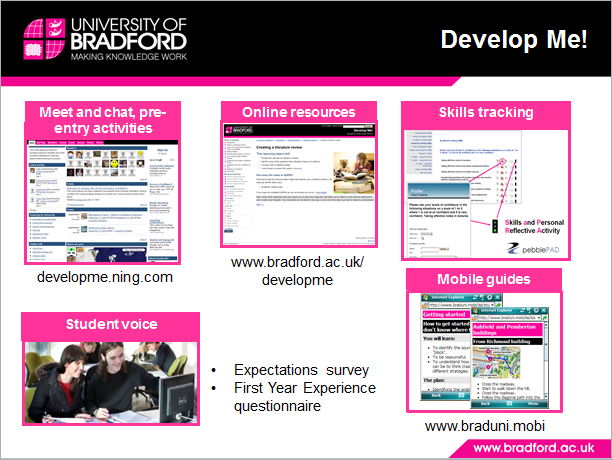 is a social network space for the University of Bradford. The site is open to anyone involved in the University of Bradford. From the PowerPoint above you can see includes the social space via ning, online resources, online self-assessment tool which I find interesting. So it seems to be a ‘one-stop shop’ – pre-entry, orientation, online resources, skills tracking…I guess students probably then migrate to Facebook once they feel more established but I thought it appeared to have lots of benefits. Obviously very helpful for pre-entry students, pre-Christmas wobbles etc. I am struggling to find much commentary on whether this is the case but it appeals to me. For me this also links to the acquisition of tacit knowledge / transitions which are discussed in Wenger’s CoP. It is this awkward fumbling forward due to a lack of knowledge on ‘how things are done around here’ that make us uncertain even though we are capable. So I think anything that helps with this has to be a good thing. It has one very interesting additional part which is discussed further in the book and this is the ‘student voice’ part which is helping to shape changes at the Uni. able confidently to use digital technologies to reflect on, record and manage their lifelong learning. This struck a chord with me because I attended a JISC event where the Beetham and Sharpe model below was used in a workshop. 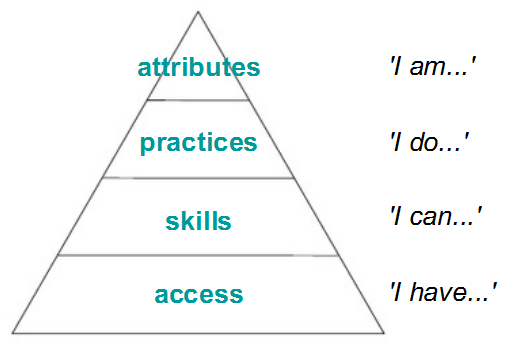 If we can articulate the practices that we hope to see as a result then it is easier to find a route to it, also that this can be aspirational and lifts us beyond ‘skills lists’ onto practices and then attributes/ identity.